Professional 360 cameras provide breathtaking panoramic views. These are ideal for filming when a larger perspective is necessary. With the right 360 camera accessories, you can even attach the camera to a drone for aerial views. If all you want is to capture footage for a VR headset, then you'll appreciate the simplicity of consumer 360 video cameras. In addition, the quality of video is just as good as you might expect from a standard camcorder. You can get a 360 video camera with 4K-quality images, which can even live steam the footage. If you want to document a tour of a famous historic location such as a Roman forum, your viewers will love the high-quality film streamed in real time. What's a Professional 360 Camera? A 360 video camera captures images in every direction at once. You can accomplish this with either omnidirectional cameras, or by stringing multiple cameras together at once. The presentation of the video is the thing that makes these cameras unique, however. With a VR headset, you can immerse your viewers in the environment much as you experienced it. While it isn't a perfect substitute for being there, the VR option is a significant step above traditional video. If you want your viewers to relive the experience of an extreme sport such as skydiving, then a 360 VR camera leaves a lasting impression. Giving your viewers control of the direction they face can be a nice alternative to the VR presentation. This style allows your viewers to use a mouse to spin the direction they're facing at any time during the video. If you want to record a movie of your scuba diving adventure on a 360-degree video camera, your viewers will enjoy being able to choose if they want to face the dolphins at the front or the coral reef at the rear. How Does 360 Video Work? Professional 360 cameras capture their panoramic images by either linking images together or recording them from varying perspectives simultaneously. You can also accomplish this perspective by linking several cameras via a 360 multi-camera holder, which achieves the same effect with editing software. 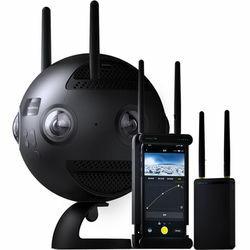 If you want to create compelling 360-degree perspectives in your movies, then a 360 video camera will record all the angles at once, and automatically connect each camera's perspective. You can then edit the footage in much the same way you would a standard video, although you may need specialized software. Whether you want to film extreme sports or you just need a panorama of a cityscape, a 360 professional camera captures the event from every angle. 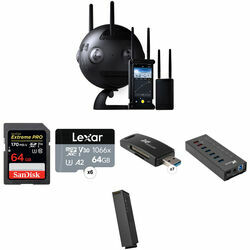 Check out B&H Photo and Video's selection of professional 360 cameras and even 3D video cameras to find everything you need to film your own VR footage.